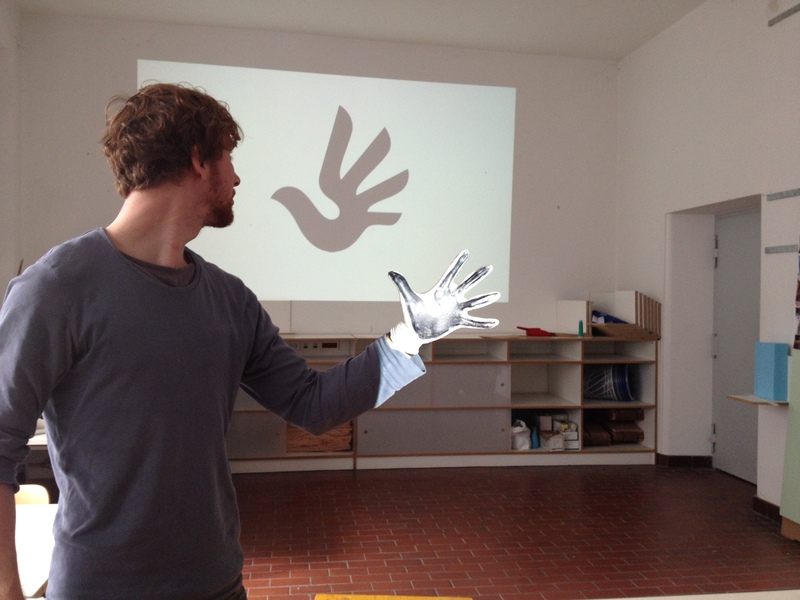 We are currently installing the FutureCityLab installation at the AEDES Gallery in Berlin. The exhibition will feature the urban foresight unit as a six weeks laboratory with round tables every Wednesday and workshops almost every week-end. The curatorial concept developed by anOtherArchitect is reflecting this idea of a work in progress show featuring large blackboards made out of Eternit fibre concrete. Each of the blackboards has another function: the roundtable is surrounded by a long time line which is the graphic recording area for the events. The workshops will take place on a long table at the window and a huge free zone at the entrance will enable the participation of the visitors by leaving comments and ideas. More about some technological features of the exhibition after the opening. We can´t believe it. It´s only one week left until we open the FutureCityLab exhibition in Berlin. Join us for the opening on the 22nd of May at 18:00 at the AEDES Gallery in Berlin. 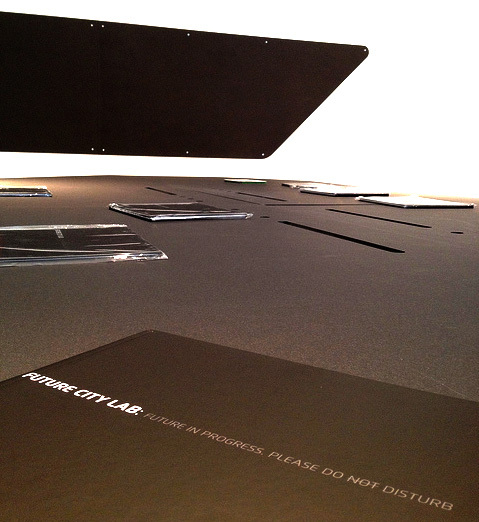 FutureCityLab – PLEASE DO DISTURB! YES! It´s true FutureCityLab will host a big exhibition in Berlin during the BMW Guggenheim Lab at the AEDES gallery. More info to come soon but you should save the dates already. From 22nd May until 5th July we will have exciting events every Wednesday and every week-end in our own LAB at the Pfefferberg. COME AND DISTURB US – JOIN THE CONVERSATION. We are now in a period of unprecedented ecologic, climatic and energetic change on a global scale. We will have to address a number of urgent and intransigent issues like food and water shortage but also sustainable mobility and the necessary proliferation of energy sources. Future Cities will have to respond to these changes and utilize the inherent opportunities to emerge as vibrant, energy-efficient and sustainable cities. Radically changing migration patterns, rapidly expanding urban populations and the need todrastically reduce CO2 emissions in the building stock to 10% by 2050 (EU-carbon Roadmap 2050), makes cities the focal point in the search for solutions. But what might these solutions be? Can we imagine, now, what those cities might look like? In order to answer these questions, institutions, educators and leading professionalsworldwide have collaborated to launch the open-source initiative Future City Lab. The Lab initiated by Thomas Auer (Transsolar) and Daniel Dendra (anOtherArchitect) in 2010, is a distributed non-hierarchical mechanism for the envisioning of sustainable futures. Organized as a complex multi-layered peer to peer network, FutureCityLab seeks to mobilize the efforts of students of architecture and urban design around the world, combined with the expertise of associated experts. Through networking and social media technologies we are developing a global, grassroots discourse on what we need to do as a species to address our cities’ most pressing issues. In creating an opensourced database of research and ideas, FutureCityLab looks to build, in a manner akin to crowdsourcing, viable and achievable visions for our urban future(s). Cities in progress: Please do not disturb is an exhibition in two distinct parts. 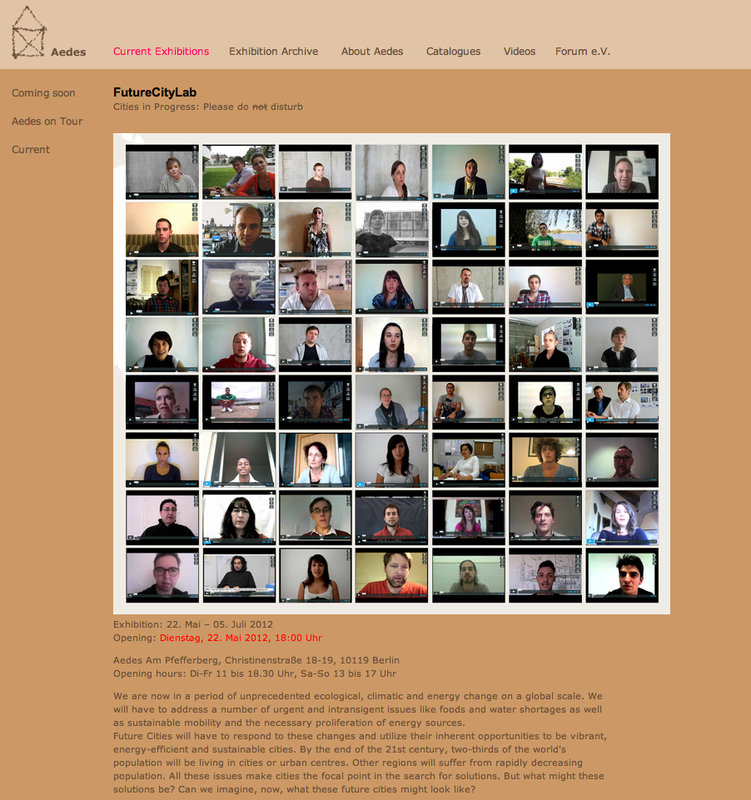 First, the discussion and visualization work that FutureCityLab has undertaken over the last year is compiled and presented through the medium of DIALOGUES. The second part of the exhibition, DIALOGUE 2.0, is projective and inclusive, using the event of the exhibition as an opportunity to move the discussion forward and to increase the scale and scope of the FCL network. The goal of DIALOGUE 2.0 is not only to engage FutureCityLab participants but also the larger public, using the gallery as a context for the construction of future scenarios. These will emerge from a series of workshops and structured discussions, and will be conducted by FutureCityLab experts. The video is showing former anOtherArchitect : Bruno Pereira (OpenSimSim Lisbon) and Andrea Graziano from Pinerolo discussing some thoughs on what type of connection should we use to build the chair/stool in fiberconcrete sheet. in order to concentrate more on upcoming projects I am trying to reduce my traveling and teaching engagements. Nevertheless there is couple of possibilities in the following month to meet. OMSK (Russia): on the 20th and 21st of March there will be several events in Omsk during a design festival. Amongst others there will be a public lecture and masterclass. SAMARA (Russia): In March or April there will be also a public lecture at the university of Samara – the date still needs to be confirmed. PHILADELPHIA (USA): on the 3rd / 4th of April and the 2rd / 4th of May I will join the jury panel at the UPenn university. 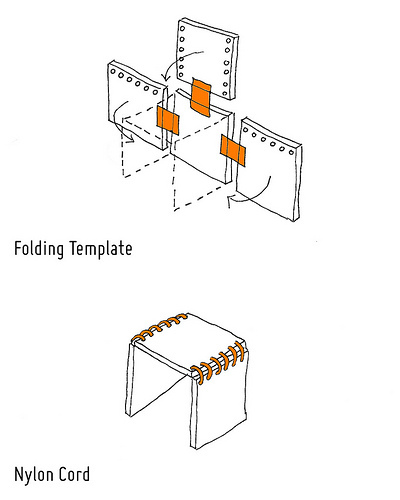 I will be guest critic at the mid- and final review of the class of Prof. Martin Haas (Behnisch Architects). On this trip I will pass through New York as well so lets get in touch if there are any interesting events going on in NYC as well. I was invited as a guest critic at a presentation of student work on the topic INSTRUCTABLE VIDEOS for a new logo for human rights. The logo is the result of a crowd sourcing competition at Jovoto and was financed by the German Ministry of Foreign Affairs. It is representing a mix between a dove and a human hand. The task of the students is to create a viral video that is spreading the logo worldwide or that is instructing them to re-draw, re-construct, re-play the logo. It was very interesting to discuss about viral videos and the needs of a logo for such a precious goods such as human rights. The workshop is led by Prof. Axel Kufus (UDK Berlin) and media artist Daniel Schulze (bitsbeauty).